Treasure Flower is an extremely beautiful plant. It produces showy and captivating blossoms. Definitely a sight to behold when in full bloom with their vibrant flower colours. These beauties not only are appealing to the human eye but attract butterflies and bees too. 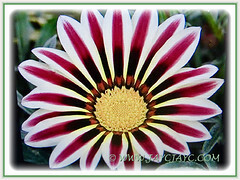 Botanical Name: Gazania rigens (syn. : Gazania splendens, Othonna rigens, Gorteria rigens). 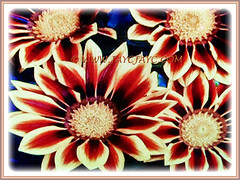 Common Names: Treasure Flower, Terracotta Gazania, Coastal Gazania, Butter Flower. Etymology: The genus name, Gazania was named in honour of Theodorus Gaza, a 15th-century translator of the botanical works of Theophrastus from Greek to Latin. Gaza in Greek means riches, referring to the richness in colour, variety and abundance of the plant. Origin: Native to South Africa. It is naturalized and cultivated worldwide. 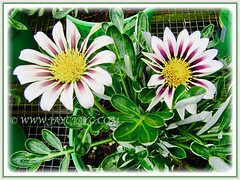 Gazania rigens is a low-growing plant that reaches up to 50 cm tall and spread as wide. The blue-grey leaves are linear to linear-lanceolate in shape, up to 1 cm wide. They are usually compound, pinnately lobed and held in rosettes arising from a stout, woody crown. They are rough to the touch, hairless on the upper surface but woolly white, except around the midrib on the undersides. 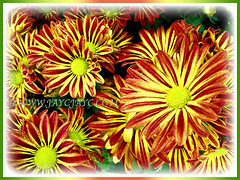 They produce large, daisy-like composite flowerheads in brilliant shades of red, pink, orange, yellow, white and even two-toned or multi-coloured. The solitary flowerhead or capitulum usually measures up to 7 cm in diameter. They are held above the foliage on a 10 cm (or more) long stem. The flowerhead consists of two kinds of florets, namely the ray florets at the margins and the disc florets in the centre. The ray florets are normally golden yellow, often with an impressive dark red base. The disc florets are yellow to reddish-orange. 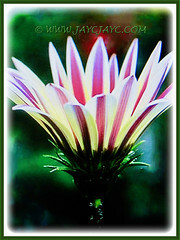 A distinctive characteristic of Gazania is that the flowering stalks contain a milky sap. Also, the flowers close at night. Eventually, the flowerhead will be followed by fruits. 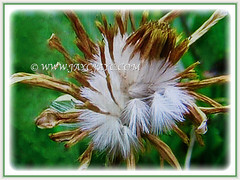 Each flowerhead contains about 25 fruits, roughly 5 x 1 mm. Each fruit is equipped with silky hairs that enable it to be easily dispersed by the wind. 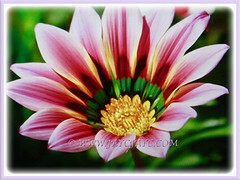 Culture (Care): Gazania rigens or Treasure Flower can be easily grown with minimum care. Moisture: Medium water needs. Water regularly during extreme heat. Drought tolerant once established. Soil: Sandy, clay and well-drained soils. It is not fussy with soil and is tolerant of almost any type of soil, including poor and dry soils. Others: Deadhead spent blooms to encourage a longer blooming period. Prune annually to stimulate new growth. Since Gazanias can succumb to stem and root rots, powdery mildew and leaf spot that can result from staying wet for too long, best to water in the morning. 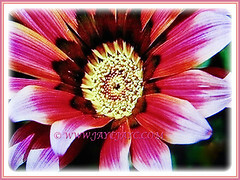 Gazanias dislike excess fertiliser. Thus, feed once monthly with a balanced fertiliser for flowering plants at half-strength. Alternatively, use a teaspoon of 10-10-10 granular fertiliser and water thoroughly. In temperate regions, Gazania rigens is usually grown as a half-hardy annual. It can tolerate only short periods of frost. Although grown as an annual in much of the country, this plant overwinters well in zones 8b through 11. The showy flowers will appear in early summer through early fall. Grow this low-growing plant outside in a container or directly into the ground. Prune annually in late winter or early spring to encourage new growth. Propagation: Easily propagated via seeds or cuttings, preferably from basal cuttings. 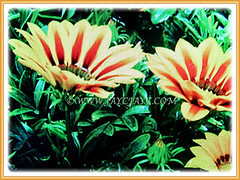 Usage: Gazania rigens or Treasure Flower, an ornamental plant with vibrant-coloured flowers will be excellent as a specimen plant in any garden. Ideal in flower beds or borders. A low-growing plant that pairs well with other plants will be great as groundcover plants. Plant them en masse with different gazania cultivars for best floral displays. 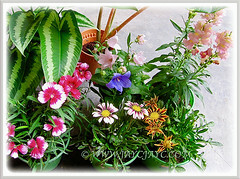 Most suited for container gardening in pots or raised planters. If you’re a nature lover, plant this beauty as it is a magnet to bees, beetles, butterflies and ants who are pollinators.